The historic marker for Canoga Spring. A very recent photo of Canoga Spring. This grist mill was erected on Canoga Creek in 1823. People gather at Canoga Spring in Seneca County in this circa 1924 photograph provided by Bill Hecht. A close-up photograph of water flowing out of Canoga Spring. Water flowing from Canoga Spring in the summer (photo courtesy of Bill Hecht). Just west of the hamlet of Canoga is the rather famous and unique Canoga Spring. Canoga Spring is one of perhaps only two extensively nitrogen water springs in the entire world. The area Indians used the word “Canoga,” which means “sweet water,” to refer to this spring — a spring they used as a major supply for their drinking water. There is a legend that Chief Red Jacket (Sagoyewatha) always took with him on his war and hunting expeditions great bottles made from deer skins, filled with his own Canoga water. Today, people still come to Canoga Spring to fill their containers with water that’s cold even on a hot summer day. Historical sources vary as to just how much water is emitted from this spring. Reports range from 225 gallons per minute to more than 600 gallons per minute. 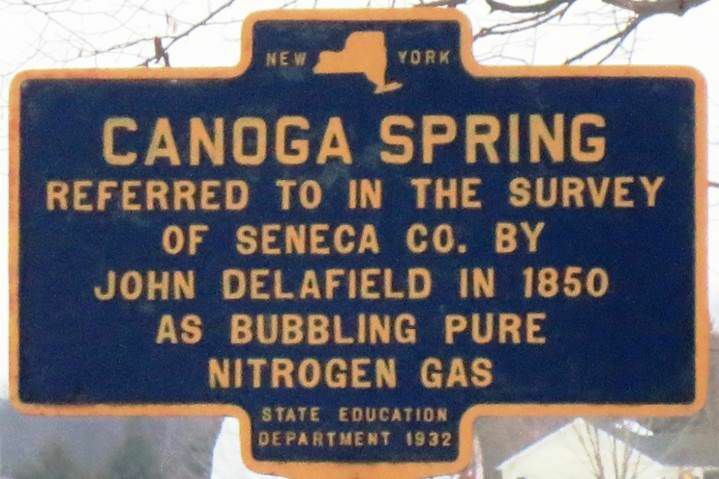 Suffice it to say that enough water flows out from the spring to power the machinery of several flouring mills, saw mills and other works powered by the Canoga Creek between Canoga Spring and Cayuga Lake. My great-grandfather, John L. Hoster, and his sons operated both a saw mill and a cider mill for many years very close to the Canoga Spring. Many senior citizens who grew up in the area recall fondly those times when as country school students they were rewarded by all going down to Canoga Spring and having a drink of the cold water. Can’t we all imagine how enjoyable it must have been for people of Auburn or Ithaca, etc. to take a leisurely drive in their car on a nice afternoon and stop at Canoga Spring? Those were the good old days! Gable is the Seneca County historian.